After writing this liturgy this morning, I am more convinced than ever that we should never, ever celebrate the Transfiguration of Christ without communion. Doesn’t this ritual hit all of the high notes captured in the mystery of this story? This particular liturgy could be adopted for any cycle of the Revised Common Lectionary. I don’t think it’s too closely tied to the particular telling in the Gospel of Luke. And yet, it was written with that particular gospel in mind. As I prepare to preach, I’m thinking a whole lot about what exactly Peter and James and John saw when they saw “his glory” as revealed in verse 32. I don’t want that to be that appearance too far from the transformation that we need each and every day. All: While they were praying, their whole world changed. They saw glory like they had never seen before. One: You and I came to this holy place to pray. All: May we see glory like we have never seen before. And so, we come to see glory. when we don’t expect anything new or different to surprise us. We come to remember and believe that God is always leading us. just as God has done from the beginning of time. God has never given up on us. God continues this work today. so that we might see glory again. The ordinary will be made extraordinary. The common will become holy. The familiar will become fantastic. We come to this table again because we know we need to change. so we might always see your glory. Transform us at this table, we pray. the light of Jesus Christ our Lord. Amen. This Sunday marks one of my favorite liturgical celebrations where water is flung across the Sanctuary and we each remember our baptisms. It is the Baptism of Christ as we remember it told in Luke 3:15-17, 21-22. As our heavens are opened to remember this call to discipleship again, here is a Call to Worship that I wrote in 2013 and shared with the wonderful resource of prayers and inspiration on Liturgylink. It is slightly adapted from the original version found here. One: We come with questioning in our hearts. All: You are Beloved with who you am well pleased. Today and yesterday, I’ve read some really beautiful liturgies from friends and colleagues preparing for Advent. 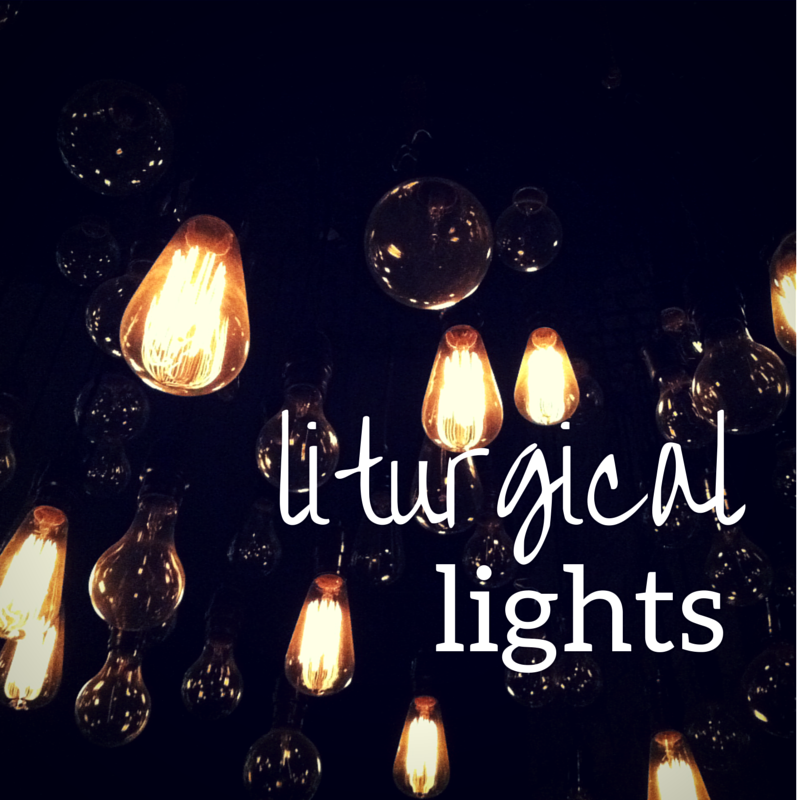 Check out the beautiful liturgies written by my friends Teri and Martha. Advent is only three Sundays away. Three Sundays. And it was 77 degrees outside yesterday. I don’t care. I’ll still crank up the Christmas carols and prepare for the coming of our Savior. This year, we actually get to have two Sundays — a whole two Sundays — to celebrate the twelve days of Christmas. It almost never happens. As Christmas overshadows Advent, we forget to celebrate the whole season of Christmas. So I want to be sure that that Light of the World for which we were waiting gets a chance to really shine. You’ll notice that this liturgy — written for one voice concluding with a unison prayer — goes all the way through the Second Sunday of Christmas. The song is from The New Century Hymnal. Night and day, we pray. We wait all night and all day to see signs that God will break into our world again, but there are signs in the sun, the moon and the stars. There is light that shines in our deepest darkness. We light this first candle in that hope. This little light shines through all our hurts and losses in our darkness. One little light reminds us that there is more than this darkness. There are signs all around. God will come again. We pray most earnestly that we may see God face to face and restore whatever is lacking in our faith. God of darkness and light, do not let us be overpowered by discouragement and despair. May the dawn of each new day become a sign that your love shines through. Help us to believe that your light is radiant and shines in our deepest darkness. Amen. Night and day, we pray. We pray constantly to overcome all of the hurts and losses in our past so that we can help prepare the way of the Lord. And so, we pray that we can take off the garment of sorrow and affliction so that we can be messengers of the Lord. We light these candles in the hope of that peace. Light first and second candles. May we stand strong and tall in light of the world. May that light illuminate the knowledge and the full insight in each of us so that we do not doubt that we have good news to share of God’s coming. Night and day, we pray. We trust, and try so very hard not be afraid, for the Lord our God is our strength and our might. It is in this knowledge that we rejoice. For the Lord is near. Alleluia! The Lord is near! We light these candles in the joy of the coming of the Lord. Light first, second and third candles. As many judgments as we place upon ourselves, as heavy are the burdens of our hurts and losses from the past, we lift our voices in song. We sing God’s praises. We are still learning the words. We’re still looking for signs but we trust that we will be messengers of God’s joy. Night and day, we pray. We have so many prayers. With Mary, we pray that our souls might magnify the Lord. With David, we pray for restoration and salvation. Through all of the prayers on our hearts, we pray that God’s love shines through. We light these candles to reveal that love in our darkness. Light first, second, third and fourth candles. This little light reminds us of the love that is always there. Even as we wait for Christ to be born again, we share in the mystery that God is never faraway. It is the love that magnifies our souls. It is the love that restores us and saves us. It is the love that is always shining through. Night and day, we have prayed. We have prayed for signs and salvation. We have prayed for peace and trust. And, now, we cannot help but sing. Praise the Lord! Praise the Lord from the heavens; praise God in the heights! The light shines in the darkness, and the darkness did not overcome it. God was there in the beginning. It all started with God. And so, we believe that God will be in every one of our beginnings. This we pray as we light these candles. Light first, second, third, fourth and Christ candles. Let these lights shine through us from this day on so that we might never forget that God is with us. God is always with us. Light of the World, we have been so afraid. We haven’t truly believed that there is good news, but you are the good news. May your love shines through us. May we be radiant in your light so that no one hides in the deepest darkness. We will tell of your love from day to day. Amen. Night and day, we have prayed. We have prayed for signs and salvation. We have prayed for peace and trust. And, now, we cannot help but sign. We sing to the Lord a new song for we have seen a great light. We who have walked in darkness, burdened by the hurts and losses from our past, have seen a great light. It is the light of the world and it is here. We light these candles in celebration of the Christ who is among us — now and always! If you happen to use this liturgy, please do let me know. I would love to hear about how your celebration of the coming of the Christ emerges. If you are looking for something a little different, you might also check out this post from last year. This Sunday is one of the days in our liturgical calendar when I would rather be sitting in the back of the Sanctuary quietly praying. But, I am called to preach. I’m called to guide myself and others through the holy mystery of communion with all of the saints. Over the summer, when I wasn’t doing much church work, I wrote weekly prayers for the narrative lectionary. It was something I called Liturgical Lights. Now that I’m serving a church as an interim pastor, I have less time to devote to writing liturgy that I won’t use on Sunday. So it’s back to the Revised Common Lectionary to be inspired by the words in Psalm 24. This is the Call to Worship that I wrote for this coming Sunday. All: This is the question we ask on All Saints Day. One: On this day, when we give thanks for those that have encouraged us in faith, we wonder if we can stand in such a holy place. We might not have the clean hands and pure hearts but still we come to worship..
All: We come to receive a blessing from the Lord. One: For this earth is the Lord’s. All that is in it belongs to God. All: We who live in this world climb the holy mountain together. Let us worship our God.